This week we were invited to take one team (a squad of 10 of the boys) to play in the Watsonians tournament. We always look to take all the boys to away fixtures wherever possible. However for tournaments we are often limited to one team, and with 31 kids in the squad it’s just not feasible to take them all. Therefore we rotate the boys that go to tournaments, and those that were at home today will get their turn to play away. It’s also worth noting that the rest of the squad were in Linlithgow training…and for the first time in 2016 it was outdoors! It will be good to get back outside and get the space that will allow us to start using some new drills. Back to the tournament…. In addition to ourselves there were three teams from Watsons, a team from Boroughmuir and a team from Murrayfield Wanderers. There was a draw for the tournament that had every team play each other, so we had five games to play today. First up was a game against the Watsons first team. The boys started fantastically, and from the beginning were tackling as well as they have done all year. However the big difference between the sides was rucking. When the ball went to ground the vast majority of the time we came back with it, and that was simply through the boys putting themselves in to the rucks with drive and good technique. We ran out comfortable winners in the end. Our second game was against Murrayfield Wanderers. In their first game Murrayfield had beaten Boroughmuir by 9 tries to 1, therefore the organiser suggested this may be a decisive game. I don’t know the final score (I struggle with simple tasks like adding…) but it was again a comfortable win for Linlithgow. Every one of our boys played well and again we saw some of the best tackling and rucking they have produced all year. And so the day continued…. we had a small blip in the first two minutes against the next Watsons team, going two tries to nil down almost straight away. However the lads pulled themselves together, showed some determination and passion and ultimately came out winners. They then went on to comfortably beat Boroughmuir and finally the last Watsons team. Yep, I can at least add up that much and I know we were unbeaten by the end of the day and won the tournament! Well done to all!! There were moments today when the rugby from the Linlithgow team was simply superb! It was fluent and fast in attack and then committed and strong in defence. Our technique was excellent and we showed that we are picking up the art of rucking, which will stand us in good stead for the rest of the season. However most importantly they all played their part today. 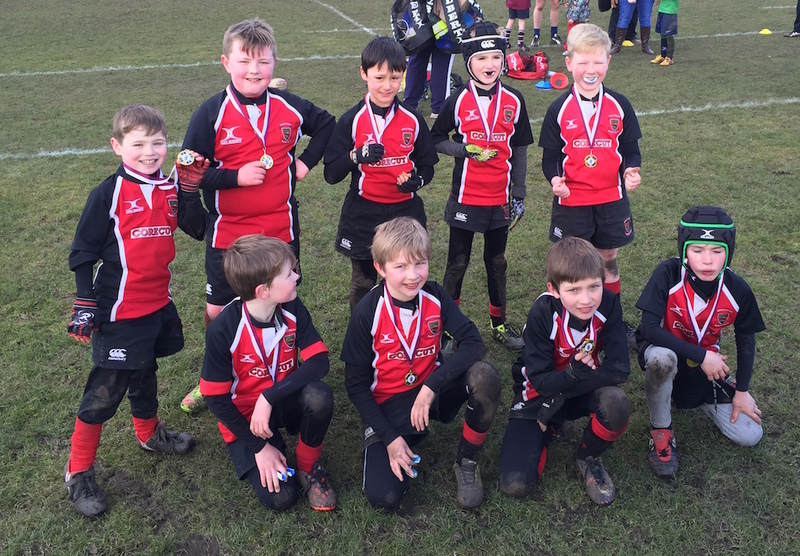 There wasn’t any one of them that wasn’t tackling, rucking and running hard … to see them all playing well is the most pleasing part as too often at this age group teams can rely on one or two players. Let’s keep up the good work please.